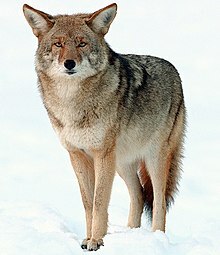 The coyote (Canis latrans) is a canid native tae North Americae. It is smawer than its close relative, the gray wouf, bein roughly the North American equivalent tae the Auld Warld gowden jackal, tho it is lairger an mair predatory. It is leetit as "least concern" bi the Internaitional Union for Conservation o Naitur (IUCN), on accoont o its wide distribution an abundance throuoot North Americae, soothwards throu Mexico an intae Central Americae. The species is versatile an able tae adapt tae environs modified bi humans. As human activity haes altered the laundscape, the coyote's range haes expandit. In 2013, coyotes war sichtit in eastren Panama (athort the Panama Canal frae thair hame range) for the first time. The coyote is mair closely relatit tae the common auncestor o woufs an ither canids (mair "basal") nor its relative the gray wouf. As o 2005[update], 19 coyote subspecies are recognised. ↑ "Canis latrans". Fossilworks.org. Retrieved 5 September 2016.